Maintain 85% of the intensity for up to 18 washes! with Joico's Nourishing Colour Butters! Joico Packs include a collection of your favourite products brought together to give real results, tailored to your hair type, whilst also offering exceptional value for money! The Cliniscalp range from JOICO marries the power of botanical ingredients. With advanced hair science to create realistic solutions for thinning hair. Split into two ranges, one for chemically-treated hair and one for hair that is in its natural state, and varying degrees of severity, Cliniscalp's 3-step regimen helps balance the scalp, providing it an optimal environment for the encouragement of hair growth. JOICO Curl range defines, nourishes and maintains curly hair for a long-lasting bounce and shine! For state of the art styling to provide incredible design, hold, definition, control and separation. For your style look no further than JOICO Style. JOICO Finish products compliment all JOICO hair care lines, for incredible shine, hold and manageability. Formulated to repair and strengthen hair to help create a great final look that is manageable. K-Pak has a high concentration of JOICO's exclusive Quadramine Complex that delivers the ultimate in healthy hair. 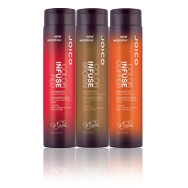 JOICO's colour range includes an array of products to bring a splash of colour to your life. Inlcuding JOICO Color Butters, InstaTints and Tint Shots, the collection's perfect for playing with your look and bringing life and vibrancy back to dull and fading locks. Neutralise brassiness with Color Balance. Colour Balance Blue is perfect for brunettes with highlights or balayage to correct orange tones. Give your colour a vibrancy-boost with Color Infuse. From golden browns to rich reds to glossy auburns, Color Infuse adds gorgeous shine to your colour, whilst protecting hair from damage for up to 25 shampoos. Smooth hair and cure unwanted frizz with the JOICO Smooth Cure range. It leaves hair smooth for up to 72 hours and reduces frizz by 79%. 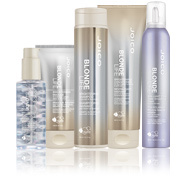 Formulated to restore shine and brighte, Blonde Life has been created by JOICO to boost blondes. Perfect for hair that's been bleached, double-processed or had the colour lifted for a beautiful blonde shade, the formulas are enriched with Arginine and an exotic blend of Monoi and Tamunu oils to banish brassiness and fading. Designed to cleanse, condition and style any hair type, this line is the main staple of the JOICO. Using exclusive formulas Daily Care is ideal for all your daily hair care needs. The volumising and thickening Body Luxe range is a cutting edge line. Designed to target fine, limp hair by increasing the diameter of each strand of hair without adding weight. JOICO's exclusive Oat Protein Complex provides sumptuous thickness and body. Protect your desired colour with this breakthrough colour preservation system. Containing JOICO's exclusive Multi-Spectrum Defense Complex designed to prolong and protect colour integrity. Quench extremely dehydrated hair with JOICO Moisture Recovery line. Featuring the exclusive Hydramine Sea Complex to add intense moisture to overly dry hair suffering from environmental or chemical damage. 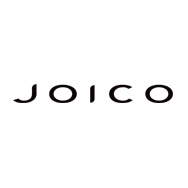 View all JOICO Hair products in one place. JOICO was founded by Sara Jones who served as a hairdresser in the industry before becoming an educator. JOICO believe that nothing compares to the beauty of healthy hair – they call this “Joi”. This is why their products are designed to restore your hairs shine, strength and health. JOICO hair products have been developed with innovative and groundbreaking technology to transform hair with outstanding results! JOICO take proud in that fact their products only contain the best ingredients, such as Shea butter from Africa, or Orchid oil from Asia. JOICO are also continually updating and developing their technologies in order to hold up their reputation. Each JOICO range has been formulated with the revolutionary Bio-Advanced Peptide Formula™ - an innovative technology that is designed to replicate healthy hair DNA to strengthen, repair and protect hair fibre from becoming damaged and weak. They offer a range of different categories of hair product within their brand which include shampoos, conditioners and treatments. JOICO Style & Finish JoiMist Firm Finishing Spray – providing an extremely firm hold which lasts all day whilst giving a great level of protection against humid environments, ensuring your style lasts even longer! JOICO Hair Shake Liquid-to-Powder Finishing Texturiser – this fine mist creates a new kind of volume whilst creating making your hair super soft. Ensuring volume as well as damage protection, you can be sure your locks will be looking their best.